Hasselblad XPan Photography Blog | Andreas Stimm's photographic work with the Hasselblad XPan camera. Now the Nepal XPan-Hasselblad picture book is published! Some promised Hasselblad XPan photos from the remote trekking route Tumlingtar-Lukla. The route follows – Salpa Bhanjyang – Gudel – Bung – Surki La – Sibuje – Panggom La – Panggom – Kharikola. It’s a trek on the footprints of Mr. Tilman. He done the first “Explorer Cross” from east to west and was searching the entrance into the Everest valley with the Dudh Koshi, starting in the eastern flatlands of the Himalaya . I’ve sorted some winter photographs from Germany. In the south-west area at the lower part there is mostly no heavy snow. But for sure you find snowy awesome landscapes in the Alps, the Black Forest and in the higher midlands of Germany. 1. During cross-country skiing, at the upper part at the Black Forest near the peak of Hornisgrinde. 2. A closeup view of a snow-icy powdered bush at the same area. 3. The “Schwäbische Alb” during icy days. 4. Again in the upper part of the Black Forest by lustre ligthning. We are back from the Tumlingtar-Everest Trek, an area with some very remote parts. Some new Hasselblad Xpan pictures, not added at the Nepal –Trilogy will be following at the start of the new year 2012.
in churches, cathedrals or halls. But Stratford-upon-Avons’s newly restored Shakespeare theatre was for me such a unique atmosphere and architectural highlight that I tried a few shoots freehand. Amazing the results. A delightful light. I used a Kodak TMAX 400, an aperture of 4.0 and an exposure time set of 0,5-1-2 seconds. 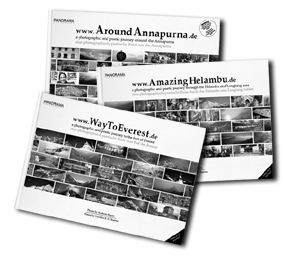 Since spring the Nepal-Trilogy with over 600 XPan-Shots (English-German ISBN 978-3-9810883-2-8) is now available in a box. Four postcards & three bookmarks are included. Annapurna, Everest, Helambu & Langtang in a timeless way. 1820 first climb from Josef Nauss, 1883 first refuge from the Alpine Club of Munich, 1900 built of a weather station, 1930 first train up to the “Schneeferner” plateau, 1931 opening of one of the highest hotels in the Alps, 1963 opening of the “Eibseeseilbahn”, yearly visitors of the Zugspitze area: 500.000 people. The Nepal –Trilogy with more than 800 pages, over 500 panoramic Hasselblad XPan photographs and over 60 poems from Nepal is launched by different events in Frankfurt, London and Paris. Poetic and photographic journeys through the main trekking areas in Nepal (Annapurna, Everest, Helambu & Langtang). Enriched with Nepali poems from the famous poet Yuyutsu R. D. Sharma.